Miss Earth 2011 is Miss Olga Alva of Ecuador. Miss Earth 2011, the 11th edition of the prestigious international pageant was held at the University of the Philippines Theatre in Diliman, Quezon City on Saturday, December 3, 2011. 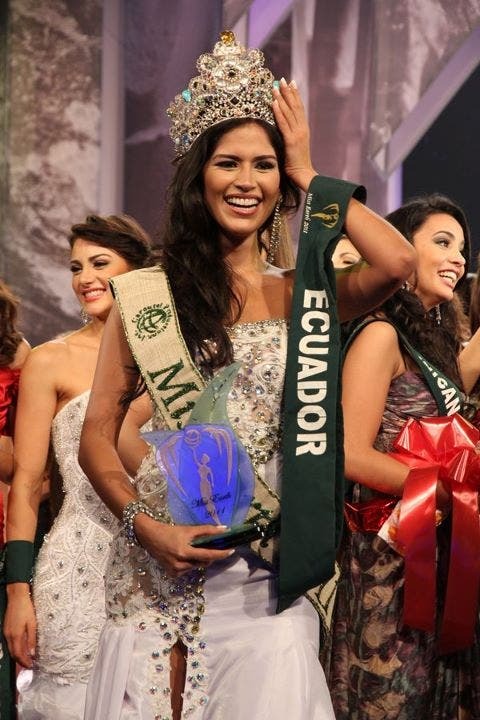 23-year-old Olga Alva of Ecuador is crowned Miss Earth 2011. She succeeds last year’s winner Nicole Faria, from India. Olga beat out 84 other gorgeous candidates to win the title. Driely Bennettone of Brazil was named Miss Earth-Air 2011, Miss Philippines, Athena Mae Imperial was Miss Earth-Water 2011, while Miss Earth-Fire 2011 was Caroline Medina of Venezuela. Philippines really did a great job on this year's international beauty pageants. Shamcey Supsup made the Filipinos proud when she named as Miss Universe 2011 3rd Runner-Up, Gwendolyn Ruais as 1st Runner-up, Dianne Necio wins Best in Web and Top 15 Semi-finalist in Miss International and now here comes Athena Me Imperial who was now proclaimed as Miss Earth-Water 2011 (2nd Runner-UP). The coronation night was aired live on Channel V at 8:00 PM. It will air on Star World on Sunday, December 4 at 6:00 p.m., on ABS-CBN and Studio 23 on the same day at 10:30 p.m. There will also be a delayed telecast of the event on The Filipino Channel (TFC) and on the television stations of other participating countries.